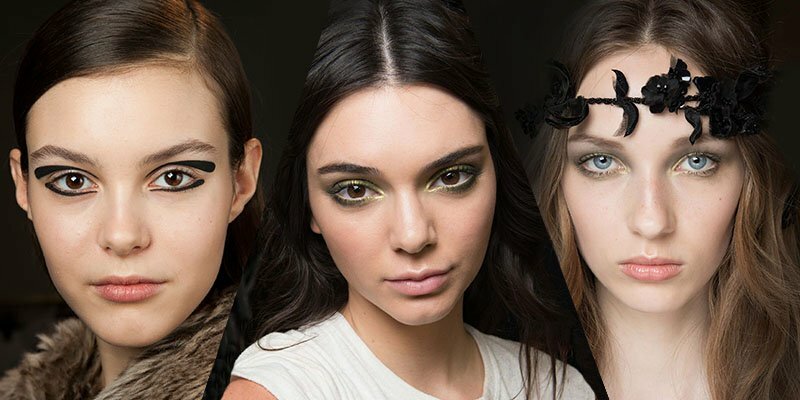 Update your look this season with the latest Autumn/Winter 2015 beauty trends inspired by the runways. 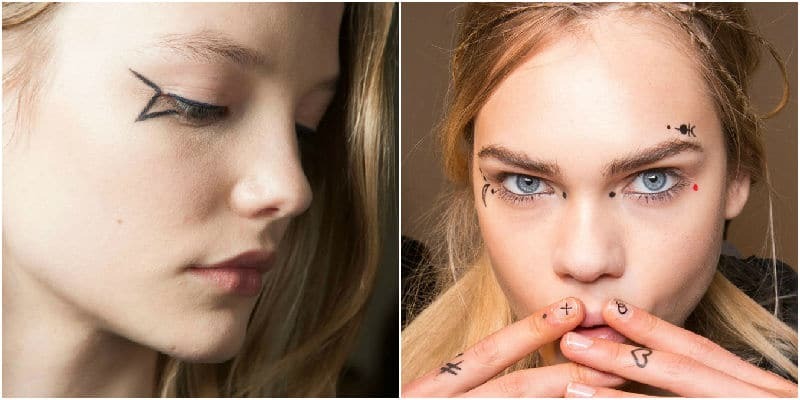 Big brows continue to reign supreme, while nails and eyes take bold leaps with artistic motifs. There is something for everyone to try on our list, no matter how brave or subtle of a change you’re looking for. Soft, full brows are maintaining their popularity this season. Forget your tweezers and instead reach for a brow brush and gel to give your eyebrows a youthful, natural appearance. 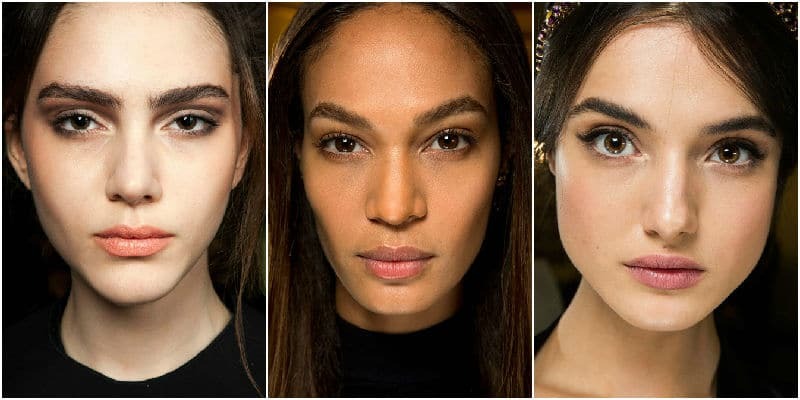 Giorgio Armani was one of many designers who choose models with full brows for her fall 2015 RTW show but models aren’t the only ones keeping brows bushy. Lily James, Emma Roberts and Keira Knightley all prefer a thick brow. 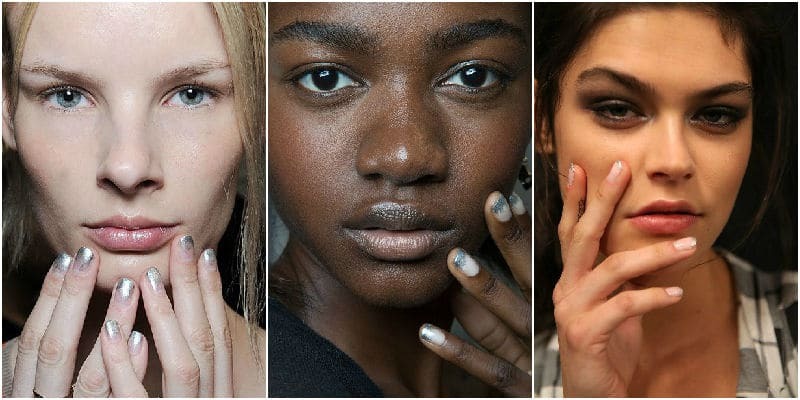 1930s half-moon manicures and silver tips are they key to making a subtle statement during the colder months ahead. With a steady hand and a touch of creativity your nails will look runway ready. 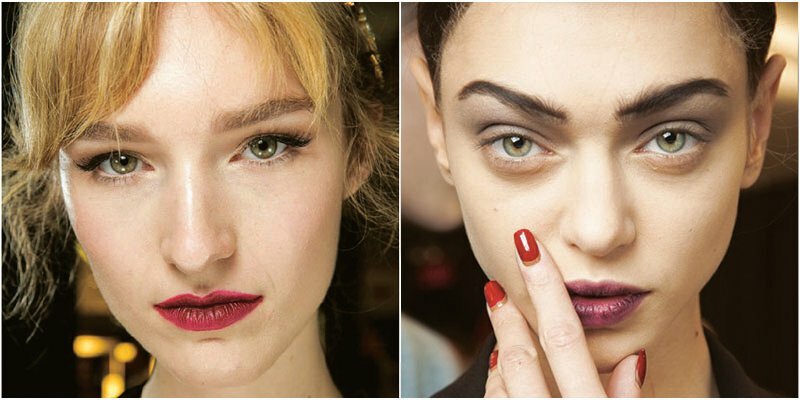 This season your lips will either be dark and moody or natural and rosy with a hint of colour. The rosy lip look is achieved with a lip balm, then by applying a blush tone lipstick and lastly by blotting away excess colour. The aim is to create an effortless looking pout, free of bright colour and harsh lines. 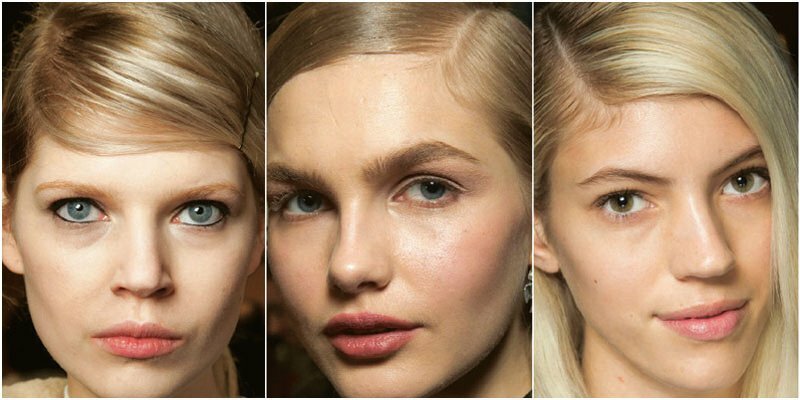 The models at Emilio Pucci all had pinched lips that complemented the soft pink blush on the cheeks. 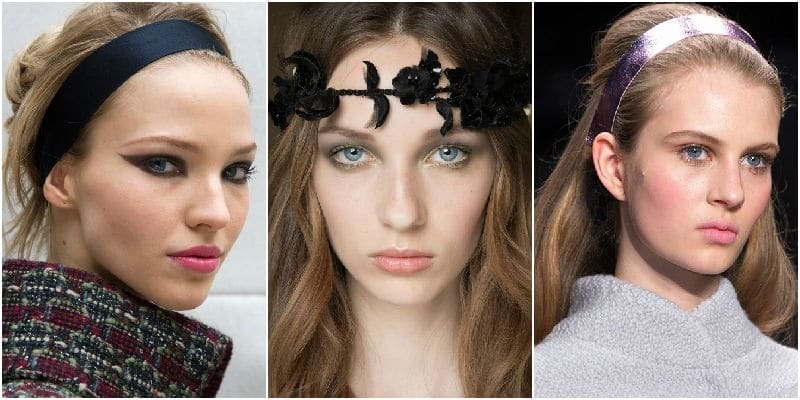 When looking for the perfect hair accessory this winter take inspiration from the swinging sixties with thick, mod headbands. From Honor to Chanel in Fall 2015 shows to Atelier Versace in Fall 2015 Couture show models kept their locks in check with metallic, leather and hand beaded headbands. 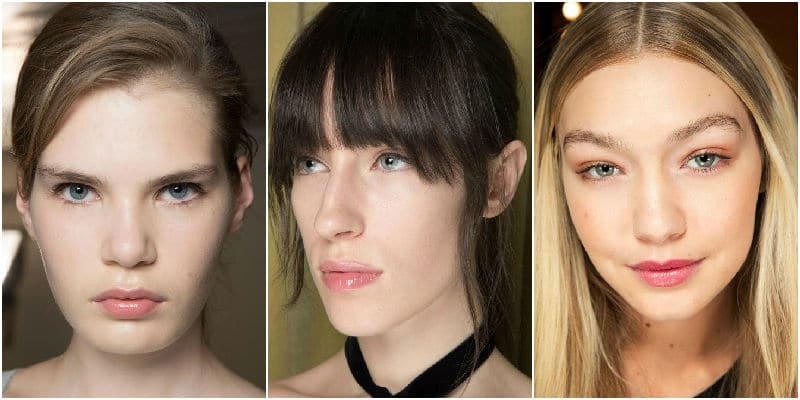 We’re all envious of the dewy complexions that makeup artists create for the runway and in the pages of magazines but in reality the look is unrealistic and almost impossible to achieve. On the other hand matt finishes can often turn flaky despite their promised durability. This winter you can have the best of both worlds. Products such as YSL Fusion Ink Foundation will give you a transparent glow with no excess shine and will last well into the day. Merlot and mahogany shades were worn across the runways and it seemed like the darker the lip the better, with many designers showcasing close-to-black looks. The models at Marc Jacobs had berry stained lips while Emanuel Ungaro chose shades of black. Dark lips work well in winter and looks best worn without gloss. 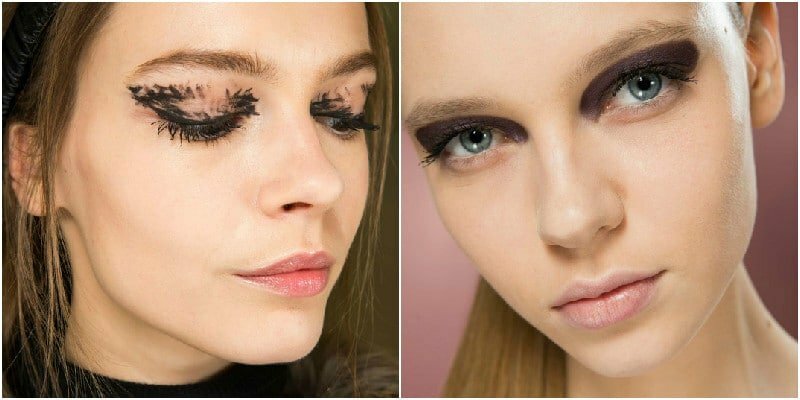 From messed up mascara to thick black eyeliner and the smokiest eyes we’ve ever seen, designers declared that no matter how you choose to paint your upper lid it is inevitable that you do it in black. 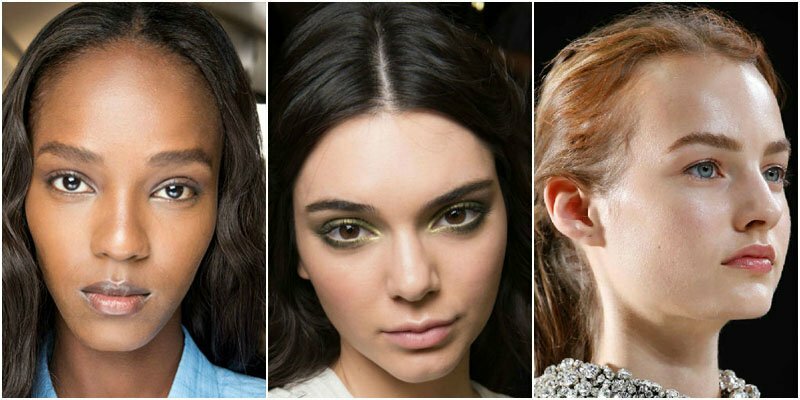 When trying this trend we recommend keeping the rest of your makeup minimal. While upper lids were kept black, lower lids were not forgotten this seasons. In fact, they were the main focus as they dripped in diamantes at Rodarte and were given tuffs of fake lashes at Mary Katrantzou. Makeup artist Val Garland asked herself ‘What would Cara do?’ when brainstorming ideas for the Giambattista Valli show. The answer was fake tattoos. Models were painted in one of a kind ink designs that brought makeup to a whole new graphic level. 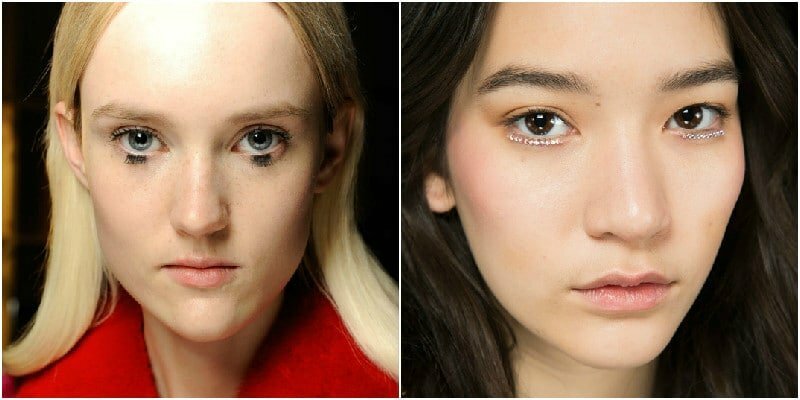 The models at Anthony Vaccarello were also inked out but the unusual eyeliner that they sported was much more street friendly. Save the typical cat eye for another day and play around with less expected lines. Forget the centre part and choose a side part this season. No matter how you style your hair, wear it with a side part like the models at Balmain and Giambattista Valli.